At the end of a road in Tunkhannock, PA., called P&G Warehouse Way, sits a warehouse stocked with Pampers diapers, Bounty paper towels and other items made by P&G. Inside the distribution center, reports The Wall Street Journal(Oct.15, 2013), is another company: Amazon.com. Each day, P&G loads products onto pallets and passes them over to Amazon inside a small, fenced-off area. Amazon employees then package, label and ship the items directly to the people who ordered them. The e-commerce giant is quietly setting up shop inside the warehouses of a number of important suppliers as it works to open up the next big frontier for Internet sales: everyday products like toilet paper, diapers and shampoo. The under-the-tent arrangement is one Amazon’s competitors don’t currently enjoy, and it offers a rare glimpse at how the company is trying to stay ahead of rivals. The economics of the arrangement benefit both sides. For Amazon, “co-location” reduces the cost of storing bulky items like diapers and toilet paper and frees up space for the Web retailer to stock higher-margin goods in its own distribution centers. P&G, meanwhile, saves on the transportation costs that it would have incurred trucking products to Amazon’s regional distribution centers. 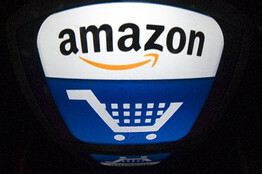 Plus, it gets Amazon’s help in boosting online sales, a priority for many in the industry. This entry was posted in Domestic Business, Retail. Bookmark the permalink.